Autumn is one of my favourite season in Japan. Come the “-ber” months and the air becomes chill, the leaves slowly turn red and the autumn colours grace the environment with its beauty. Have an ultimate fall experience by traversing to the most spectacular autumn spots in Japan! Arashiyama has been on the list of the must-visit tourist spots when in Japan. Its charm and popularity unwavering over the past years for obvious reasons, it has a lot of tourist attractions – the Arashiyama Bamboo Forest, Kimono Forest, Tenryuji Temple, Togetsukyo Bridge, Monkey Park and the Boat Tour are some places of interest. Kiyomizudera being one of Kyoto’s most popular temples offers an exquisite cityscape view of Kyoto from the main hall. The red leaves of the trees enveloping the temple and shrines around the area will look like fiery flames during sunset. Although the said historical structure is under renovation, it doesn’t hinder vacationers to enjoy the main hall. Bishamon-do is a temple wonder situated in the suburbs of Kyoto. It transforms into a wonderful spectacle when leaves turn red and fall on the stone steps. Tofuku-ji temple boasts a number of Zen gardens where visitors can appreciate the beauty of the dry landscape art. The view from the Tsutenkyo Bridge is not to be missed in the autumn season. Autumn in Korankei won’t disappoint because of the autumn festival which lasts for a month. They also hold light-up events as the night falls. Obara Fureai Park is where spring meets autumn. Yes you read it right, you can see both cherry blossoms and maple leaves in Obara town located in Toyota City, Aichi Prefecture. The Ena Gorge, located in Ena City, Gifu Prefecture is one of the off-beaten tracks you can visit. Enjoy the scenic area in a boat and spot some mysterious rock formations as you glide along the river. Get lost in the past and discover some of the structures built in Japan during the Meiji Period. Dress up either in a traditional Japanese school uniform or in a Western-style clothing. Sobue is located in Inazawa City in Aichi Prefecture. In the middle of November, the leaves of about 10,000 gingko trees will turn yellow and will transform the place into a golden town. Are you a deer whisperer? This is your chance to feed and take a selfie with the deer freely roaming around the Nara Park. Just a gentle reminder to try to be vigilant as some deer have the tendency to charge at tourists anytime. You cannot miss out Korankei Gorge located in Toyota, Aichi Prefecture. It is a favorite among tourists who visit Central Japan in autumn. Gracing the valley with colorful tones, no wonder each year the flock of visitors increase, making the place congested! While the afternoon view is a beau, wait until the golden hour happens and get surrounded by the stunning color variation of the valley. I got to witness the autumn colors in daylight and dawn when the trees are illuminated. The scenery in the afternoon and night varies greatly but both have their own charms. Production crews televised the crowd of people, interviewed some of their Korankei experience despite the cold windy weather and showcased the highlights of the illumination. Autumn festival is held every November wherein lots of food stands line up along the streets. Also, there are a few restaurants where you can warm up from the chilly weather. You cannot let summer pass without doing barbecue party and river wading. When you want to go somewhere relaxing and far away from the stressful city life, the Wood Design Park in Okazaki is one of the best summer escapades you’ll not want to miss out. The park boasts its “wood tile design” which sets the mood in a state of tranquillity. Moreover, it is being surrounded by nature as it is located in the outskirts of Okazaki City. There are three plans for the barbecue courses you can choose from, the first one is bringing your own food (reservation until 5pm one day before arrival), the second one is going empty handed wherein the management provides the food (reservation 3 days before arrival), and the last one is the rooftop plan wherein customers will have to bring their own food and take the rooftop spot (reservation until 5pm one day before arrival). All plans are inclusive to unlimited non-alcoholic drinks. From outdoor treetops to hanging wooden pods, the park presents different kinds of spot you can explore. To fully experience the luxurious glamping, visitors are encouraged to swim or wade in the rivers surrounding the park. Toyokawa Inari is one of the shrines where you can see hundreds of fox statues. The fox statue, being a popular diety in Japan, is believed to bring prosperity to its devotees. It is said that the fox statues were donated to the shrine by industries with their names carved below the stone to pray for the success and growth of their businesses. Thus, resulting to the infamous hundred fox stones. At the opposite side of the shrine entrance is a place called ‘Monzencho’ where small souvenir shops and restaurants offer various local delicacies. You should not miss it the special Inarizushi they are selling here! This trip was made possible by KIS International Tour’s one day bus tour. If you want to know more of their tour packages, feel free to comment below. Suhara Himawari no Sato is found in the neighbouring prefecture of Aichi – in Mino City, Gifu Prefecture. With almost 30,000 (big and small) floras, this sunflower maze is a sure delight to tourists. A group of wild sunfloras appeared! If you are into cosplaying and want to add spice in your photo sessions with the sunflower, then Suhara Himawari no Sato is the place for you! There is a myriad of costumes they provide for their patrons with a rental fee of 200 yen for one hour per costume. Should’ve done the “In My Feelings” challenge because… Kiki! If you have watched Studio Ghibli’s Kiki’s Delivery Service, you will be familiar with Kiki’s costume and her cat, Jiji riding the broomstick. Kiki’s costume is the most popular, with a simple dark blue dress and a red bow-tie headband, there is no hassle in transforming into a witch. Imagine that – you can be an enchantress and float above the sea of yellows and greens! While you’re at it at Mino City, you can visit some of its charm points that will surely make your trip worthwhile. The Nagara River will greet you upon arriving to Suhara Station. Beat the summer heat by swimming in this river and do barbecue party with your family and friends. Do not forget to bring a change of clothes and remember to always be vigilant and extra conscious about your safety though! Just less than 10-minute walk from the sunflower field, you can see the Suhara Shrine. Worshippers visit this shrine for good harvest as it is known as a shrine for the god of agriculture. Travel back in time to the Edo period and see the Udatsu-styled houses near the Umeyama station. Kimono rentals for men and women are available for your full experience as you indulge deeper in the traditional culture of Udatsu. (Rental fee is 1,500 yen. Reservation is necessary through 090-3934-3443). You can also visit the Ogurayama Castle Ruins just near the vicinity. Situated nearby the contemporary Mino City Station, the Old Meitetsu Mino Station retains its entrance façade, the ticketing booth and a little part of the railway displaying three old Meitetsu train wagons. This is another area to go retro and feel the olden days of Japan. So last Friday, June 29, 2018 at 8 o’ clock in the morning, the Shimoyoneda Water District Supply has announced a temporary suspension of its water supply to the city of Minokamo City in Gifu Prefecture of Japan. This is an unexpected ordeal to my family and the rest of the residents in the said city. But as expected from our alert city officials, water supplies were dispatched everywhere to supply water to everyone. The quick response gave a relief to locals as they get their supplies from trucks patrolling the city. Drinking water are also being distributed that comes with a fancy design and the city’s name written on the bottle. Such occurrence has never happened before since we moved here. In this intense heat the summer graced to us this year in Japan, we’re grateful for the quick response of this matter by the officials. Suspension has been lifted off the next day, June 30th, around 11 pm. Marvel has come to Japan! Pack your things and head to Nagoya City Science Museum located in Nagoya, Aichi, Japan to see the Marvel: Age of Heroes Exhibition! Come and experience the wonders of the works of Marvel. From drafts to comic books, the exhibit brings you back from its conception to what it has become today. Don’t miss the photo ops with the Hulk at the entrance of the museum and Tony Stark’s Hall of Armors. Also, make sure to witness first-hand the demonstration of the movement of plasma inside iron man’s arc reactor! Mandatory photo after the visit! Photography is strictly prohibited in most areas of the exhibit except with signs that allows photo taking. A discount of 200 yen will be effective if the ticket is bought in advance. Tickets include the Science Museum admission. Additional charges apply for inclusion of the planetarium admission. The museum is open from 9am to 5pm, Admission hours is until 4:30pm. It is closed every Mondays (except April 30, 2018), every 3rd Friday of the month and on May 8, 2018. The exhibition is only for a limited time, which is from March 17 – June 10, 2018, so what are you waiting for? Visit the three shrines to have a good luck in love! Located in Nagoya, the three shrines, namely Takamu Shrine (高牟神社) Yamada Tenmangu (山田天満宮) and Shiroyama Hachimangu (城山八幡宮) are said to grant you good fortune in love. 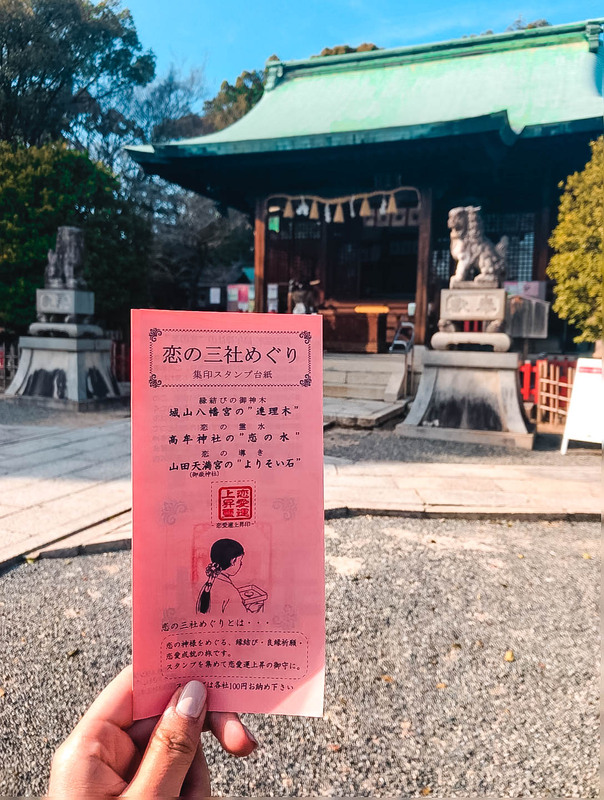 Upon visiting the shrine, visitors will need to get a paper in pink color and inside it is another paper called 願いの文or Wish Statement. 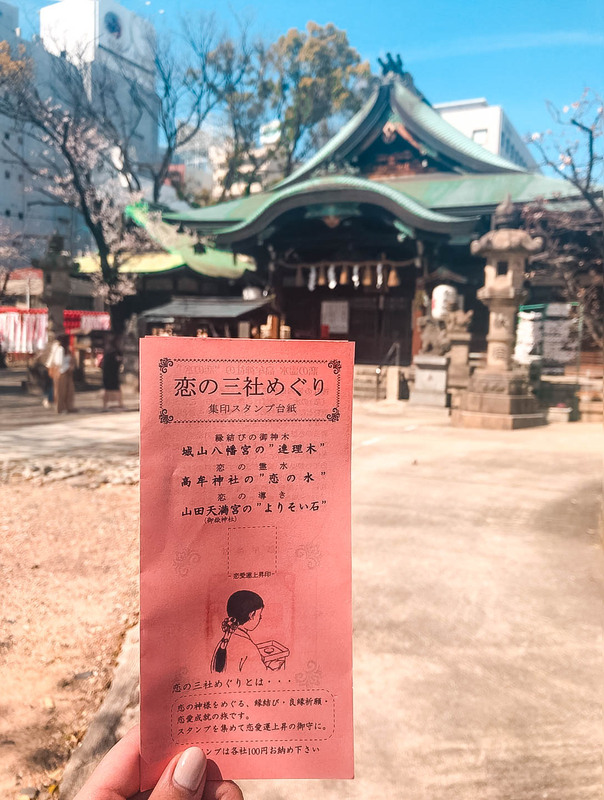 In Yamada Tenmangu and Shiroyama Hachimangu, the pink papers are also placed somewhere the shrine, so visitors can take one and get it stamped by the officials. Visitors need to pay 100 yen per stamp in each shrine. First stamp at Takamu Shrine! Got my paper stamped in Yamada Tenmangu! Cleared all three stamps and you got an additional stam in the front page! In my case the paper is already stamped when I bought it and I just have to pay for a hundred yen. And after collecting three stamps from each shrine, a souvenir is given regardless which shrine you came last. In addition to that, they will ask you to write in the Wish Statement. Got my souvenir after completing the stamps! So why are these shrines called the power spots of love? In Takamu Shrine, it is believed that its water well has one of the best waters in Japan and is famous for granting longevity and a promise of romance once you drink it. In Yamada Tenmangu, a stone of a couple snuggling who watches for everyone’s happiness in love can be spotted in the shrine. Throw a donation in the box on the left and touch the stone while asking for a wish. The Renriboku in Shiroyama Hachimangu is known as the sacred tree for matchmaking and marriage. You can also touch this tree and make a wish! Beside the tree are wooden wishing plaques (ema) with people’s hopes and wishes written on it. The location of this tree is pretty tricky since it strays away from the shrine. If you want to get there, from the area between the parking and entrance of the shrine, walk on path to the left then to the curved path and you will notice a huge tree with a rope tied around it. There is no decided sequence in which shrine you have to visit first, but since the shrines are a few blocks away from each other, it is recommended to visit the nearest shrine from your location first. 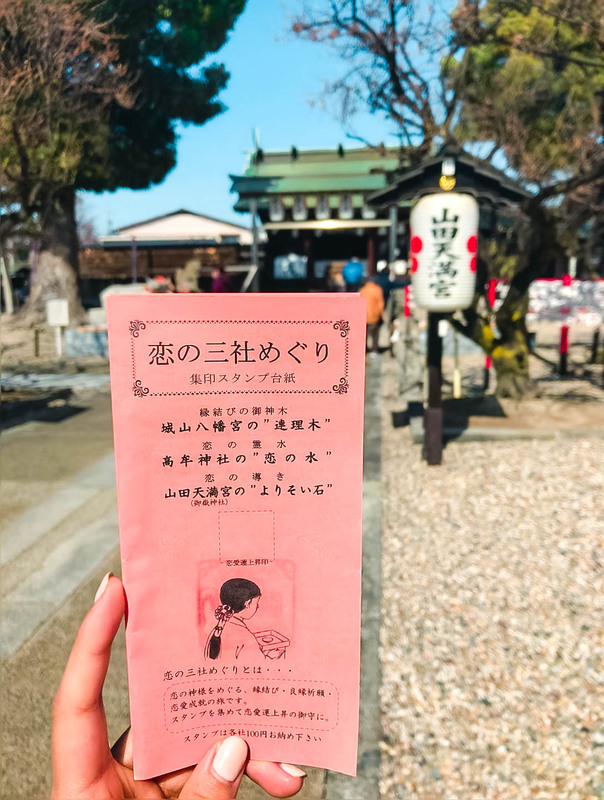 Aside from love luck, each shrine also offers various lucky charms and also grants different kinds of good luck so make the best out of your visit in all shrines! 古井の水 = 恋の水 because 恋 and 古井 are both read as Koi. Hence, 恋の水 may be a wordplay of 古井の水. Click here if you want to find out more shrines with love luck near you!